So I'm sitting here at my computer with a head full of chemicals, antibiotics, nasal sprays, kitchen cleaner and whatever else I can find to clear the most debilitating sinus infection in the history of mankind and recorded history when the purple elephant wearing a red fez next to me reminds me that I haven't shared the good news about the Elba turnout. We actually got a call out for 4th place brisket (our highest to date) and finished 12th out of 22 (again our highest to date). We missed placing in chicken by .10 which is pretty darn good considering the field against which we competed. We were up against the usual suspects i.e. Forrest's Fine Foods, Cooks Portable Smokehouse, and Swamp Boys. I got to meet Mr. Bagby of Swamp Boys. Nice guy, and to quote him, "That damn meatloaf." Of course Forrest Fine Foods took the People's Choice Award.....again....Myself along with a couple of others thought about tripping the people transporting his entry, but we thought better of it....mostly because Forrest is a man with hands the size of really good hams and I can't run for long. Who am I kidding? I can't run at all. As always, we were proud for him, and he is a really stand-up kind of guy. We also have settled on a name for the little red wagon: Shangrilah. Why Shangrilah you ask.....or not? It sounds cool and I stole it from an episode of Frasier where Frasier's brother Niles was living in a low-end apartment complex called The Shangrilah Apartments. So there you go. 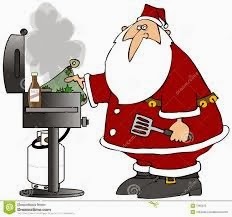 So do BBQ and the holiday season go together? Of course they do. Even the purple elephant agrees....You know, it might be time to back off the medications for a bit. Anywho. BBQ and the holidays have one common theme: Time with friends and family. Whoever heard of someone attending a BBQ where everyone hated each other unless you are talking about Ghengis Khan having a sit down with the village he just razed and took over. Since the dawn of time, or at least 15 minutes past, friends and family have been gathering around a fire to cook meat, share the day, and generally take time to become closer. We aren't any different from our ancestors except our fire pits now cost anywhere from $3,000.00-$12,485,233.00 whereas the fire pit of old was a hole in the ground which cost exactly $0.00. No matter what you call the holiday season from Christmas to Hanukkah to Kwanzaa (which I really don't know what it is except they have a card for it at Winn-Dixie), the goal is the same: Time with those you love or at least those you can tolerate on a small scale. What foods do I recommend? Well, turkeys smoke up nicely as do brined pork loins. Get crazy with it. Nothing says you can't have smoked goose or chicken. Heck, smoked fish is just about impossible to beat. Some of the best fish I have ever eaten were trout that I caught myself in Montana that were then slow smoked over a low, oak fire. I'm wanting to roast some sweet potatoes in the smoker to see what happens. There's got to be some smoke flavor that makes its way into the tuber. In that vein of thought, I challenge all readers to cook an entire meal in their smoker from the meat to veg to the rolls. Just think of it as a really large croc pot. Come to think of it, maybe I should make a greater challenge: To be with the ones you love (or mostly tolerate) during this holiday season with a focus on what's really important. As for me and my house, we will say Merry Christmas 'cause that's how we roll. The ultimate gift was given over 2000 years ago: Salvation through Jesus Christ. The BEST gift ever. For all have sinned and come short of the Glory of God. No one comes unto the Father but by Me the Son. Got questions about and how you can have this nonrefundable gift of Salvation, ping me and we can discuss. Y'all take care, keep the fires burning. Oh and Riley says, "Merry Christmas....and I want a big chew toy from Santa...the one they show from Pet Smart on their commercials."